I’m visual and I love words. Those of you who know me may say I love words too much! It’s even better when I’ve found the perfect word to express a thought or idea. Oftentimes I can’t capture exactly what I mean in a word, but it’s sweet when the right one comes to mind. Drive – That’s a good one. It evokes setting direction, moving forward, being in control, steering things. Stretch – Ooh, another good one. I need to exercise, do more yoga, take our career coaching to the next level, challenge myself. Optimize – Nice. Make things better, be efficient, good for time management, cleaning out email and my house! I rolled a few of these around and others in my head, but couldn’t come up with THE word until I thought, “maybe I can have my cake and eat it too with an acronym.” Genius! So my word for 2019 is SOAR! I love that I see a visual image in my head. I picture a giant bright colored hot air balloon soaring up and across the sky with beautiful vistas below, and I used images of balloons on my Trello board, where we put our goals. SOAR stands for Stretch, Optimize, Affirm, and Refine. SOAR checks all of the boxes. It accounts for mind, body and spirit for me and totally works for my home and work life. As you could see from my list of finalists above, I already had Stretch, Optimize and Refine. So it didn’t take a genius to see that SOAR was a possibility. So what “A” word will do the trick to make this work? Instantly, I thought of Affirm. In The 5 Love Languages: The Secret to Love that Lasts, by Gary Chapman, Affirmation is listed as one of the love languages. It also happens to be my husband’s love language, and don’t be shocked, but I’m not always the best at affirming him. Immediately, I knew that I can do better and that it works perfectly. I can affirm him, my children, friends, colleagues, and even clients more. When it comes down to it, what I love more than words is people and my relationships. Sometimes when I get busy with work, stuff, social activities – basically life, I forget to tell those who are important to me how much I appreciate them. So in 2019, I’ll be soaring to new heights in many ways and I’ll be communicating how much color, richness, excitement, support, and positivity you add to my world. Need to Stretch, Optimize, Affirm, and Refine your HR processes in 2019? Reach out to us at Purple Ink if we can help your HR department soar! 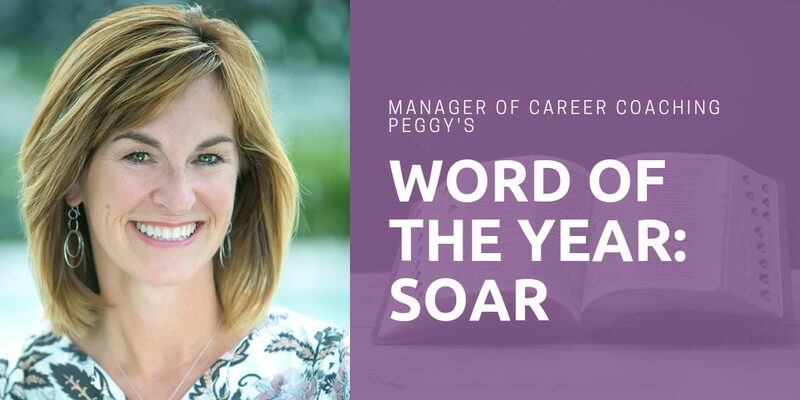 Peggy is the Manager of Career Coaching Services at Purple Ink. Peggy enjoys connecting the right person to the right place, whether she’s career coaching, recruiting or working on-site with a client. She is motivated to help create positive workspaces by offering creative solutions to problems in the workplace, resulting in reduced turnover, higher employee engagement and increased productivity. Love this blog, Peggy! Leave it to you and your Ideation in coming up with an acronym! Thanks for the inspiration!